The Toyman (Winslow Schott). Art by Jesus Merino. Mechanical genius manifests in the form of many violent, destructive, and dangerous toys. The Winslow Schott version of Toyman first appeared in Action Comics #64 (September 1943) and was created by Don Cameron and Ed Dobrotka. The Jack Nimball version of Toyman first appeared in Action Comics #432 and was created by Cary Bates and Curt Swan. The Hiro Okamura version of Toyman first appeared in Superman Vol. 2 #127 and was created by Jeph Loeb and Ed McGuinness. 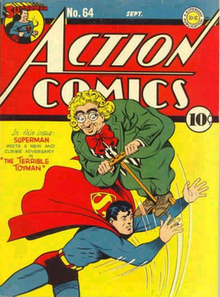 The Toyman vs. Superman, from the cover of Action Comics #64. Art by Joe Shuster. The Toyman first appeared in 1943 and appeared in several Golden Age Superman stories. Schott appeared less frequently in comics published after the early 1950s, but remained a semi-regular foe during the '60s, '70s, and '80s. While at first more of a nuisance, Toyman gradually grew more emotionally unstable and paranoid over time, his toys following suit by becoming a lot more dangerous. Although Winslow Schott in his civilian persona was a rather sweet, humble, quirky (if socially withdrawn) person, as Toyman he turned into a childish, destructive megalomaniac. During the '70s Winslow was effectively retired from crime, but he kept contact with Superman and even helped out to take down Jack Nimball, who he felt sullied the Toyman legacy. This retirement proved to be tragically short, as not long after Winslow put some of his toys on display (a suggestion by Superman), the entire museum exhibition was completely wrecked. Sightings reported this to be the work of a man in blue tights flying at great speeds. Thinking he's been played for a fool by Superman, Schott swore to destroy everything Superman cared about to avenge his life's work. Eventually it is revealed that the real culprit was Bizarro, in search for the duplicator ray, but by then it was already too late: Schott had already returned to his Toyman ways, murdered Jack Nimball and a hotel door guard in cold blood, and built a giant robot to terrorize the city. Shortly after his defeat, he regained his sanity and remembered what he had done. He shed tears of regret as he was escorted to the police car. After that incident Winslow's mental state grew even worse, and while he often made several legitimate attempts to atone for his sins, he would often relapse back into madness. After 1985's miniseries Crisis on Infinite Earths and John Byrne's Man of Steel miniseries, the Toyman's history was revised, and the post-Crisis version of the character first appeared in Superman (vol. 2) #13 (January 1988). In this version, Winslow Schott is an unemployed British toymaker who blames Lex Luthor and his company, LexCorp, for being fired from the toy company he is working for. He uses his toymaking talents to seek revenge, which eventually causes him to cross paths with the British hero Godiva, and subsequently, Superman himself. The Toyman continues to commit various crimes in Metropolis, including engaging in child abduction. The Toyman later became a much more sinister figure, shaving his head, wearing black and getting advice in his head from "Mother". This was prompted by him being told that a range of Superman action figures would not include him as he is not "edgy" enough. [volume & issue needed] While this seems to begin as a pose of what he thought people expect of a villain, it rapidly became a genuine psychotic break. While in this state he abducted and later murdered Adam Morgan, the son of Daily Planet reporter Cat Grant. Adam and several other children captured by Toyman tried to escape, but Schott found out and stabbed Adam to death for being the leader of the group. [volume & issue needed] This caused Schott to develop a hatred of children, as he blamed them for not appreciating his toys. At the time, Schott showed no remorse for what he had done. When Cat Grant later confronted him in prison he cruelly told her "You were a bad mommy. I'm glad I killed your son." The Toyman later seemingly recovered, and Superman showed him that children did appreciate old-fashioned toys, arranging parole in an orphanage; it was later revealed, however, that this was all a hallucination caused when Zatanna attempts to cure him and he had, in fact, returned to child abduction. He appeared after JLA: Crisis of Conscience where Zatanna reveals she mind-wiped him. She and Superman go after him. Zatanna is bound and gagged by him, but freed by Superman; however, Toyman escaped. Winslow was seen in Lex Luthor: Man of Steel as well as in the Infinite Crisis: Villains United special, preparing for the Blackgate Prison break by lacing the dinner stew with Venom and Velocity 9 to increase the prisoners' strength, speed, and aggression. Unfortunately, some guards also ate the drugged stew and fought the superheroes who showed up to stop the criminals. He was later seen as a member of the Injustice League in the Justice League of America Wedding Special. Toyman's history was later revised in Action Comics #865, by Geoff Johns and Jesus Merino. Winslow Schott tells Jimmy Olsen that he was a toymaker who lived with his wife Mary. When a businessman offered to buy his shop to expand the number of children his toys can reach, he refused. When Mary was killed in a car accident a few weeks later, Schott agreed to the purchase. However, the businessman lied and gave his technologically advanced toy plans to arms manufacturers. Schott proceeded to bomb the business with an explosive teddy bear. A twist at the end of the story reveals that Mary was just one of his first robotic creations. Following his first confrontation with Superman, Schott met the Prankster for the first time. [volume & issue needed] The Prankster is a cruel, callous man who commits crimes "because it's fun". He repeatedly asked Schott to "team up", but Schott refused. Schott reveals to Jimmy that the Toyman who killed Adam Grant was a robot created by Schott to replace him in the event that he was ever incarcerated and that a glitch in the robot's programming resulted in it developing a personality, (and later a hatred of children), and that Schott's repeated attempts to contact the robot resulted in it suffering from delusions of "Mother". This was confirmed in Superman Secret Files 2009, although Jimmy initially expressed doubt that Schott was telling the truth. In the 1997 Speed Force Special, the Max Mercury story Child's Play, set in 19th century New York City, featured the Schott Toy Company run by Archimedes Schott, a crooked businessman who resembles Winslow. Any relationship between them is unknown. In the Supergirl series, while in Arkham Asylum, Toyman is visited by Cat Grant (whose son Adam was murdered) and Supergirl. Cat interrogates him about children who have been kidnapped with dolls left behind. Toyman claims he is innocent and the robotic dolls attack him. Supergirl saves him and gets him to medical care. When Cat return home, she is confronted by a villain called the Dollmaker. He identifies himself as Anton Schott implying that he is somehow related to Toyman. Dollmaker eventually reveals himself to be the abandoned son of Winslow, who has been kidnapping children and using macabre experiments in order to turn them into slaves. He tells Cat that he wants her to become his new mother, and that he wishes to serve as a replacement for her murdered son, but Cat violently rejects him. With her gag temporarily removed, Cat is able to call Supergirl for help, and the two are able to defeat Dollmaker and free the children he had enslaved. The Toyman appears as part of the new Legion of Doom in Alex Ross' miniseries Justice. Toyman is only seen in person in the first and last issues of the series, he communicates through a human-sized marionette resembling the Jack Nimball version of Toyman. The Marionette uses a black-and-yellow color scheme, never speaks, and has several strings connected to its joints that give it the appearance of being operated from above. He attacks Hawkman and Hawkgirl in their museum using toy fighter planes and a gigantic Nimball Marionette, blowing up their museum and leaving the duo for dead, though they survive the attack. Toyman's city is shown to resemble a fun house and is mainly populated by children and families. When the Justice League storm the Hall of Doom, the Marionette attacks the League as a whole instead of any particular target, but is nonetheless destroyed in the attack. After the attack the toys in his city come to life and attack the Justice League. Superman eventually finds Schott, now morbidly obese and infected with Brainiac's cybernetics. Superman realizes that Toyman had taken all the children in his city hostage and, with a band of Justice Leaguers, managed to save all of the children before any harm could come to them. Schott was seen recovering in a hospital bed on a screen in the Batcave. In the 1970s, a man named Jack Nimball assumes the identity of the second Toyman during a period in which Schott retires from his criminal career and first appeared in Action Comics #432 (February 1974). Nimball wore a jester costume and used a similar modus operandi to the original Toyman. However, this version of Toyman proved short-lived. Schott killed Nimball with a mechanical toy bird and resumed his criminal career in Superman #305 (November 1976). This Toyman's only other appearances were in Action #454 and Superman #299. Nimball appears as one of Schott's androids in Action Comics #865. The version of the Toyman who appears in Challenge of the Super Friends was based on Nimball. In 2011 Mattel released a DC Universe Classics 6" Toyman figure based on the Jack Nimball version of the character. On the back, though, the character is labeled as Winslow Percival Schott. Hiro Okamura is a teenage mechanical genius from Japan first appearing as Toyman in Superman vol. 2, #177 (February 2002) by Jeph Loeb and Ed McGuinness. He shows up in Metropolis in a giant Super Robot fighting Metallo, claiming the cyborg's equally-giant body was based on material stolen from his grandfather. He later becomes an ally to Superman and Batman. In the Superman/Batman series, he aids the two in destroying a kryptonite meteor that threatens the Earth. He strikes a deal with Batman to provide him with various technological implements (Superman/Batman #7). Okamura uses more technologically advanced devices than the traditionally-constructed contrivances Schott uses and his work is largely whimsical in nature. Many of his inventions are inspired by anime and manga, including giant mecha (notably his giant Composite Batman-Superman robot). Okamura appears only a few times in the Superman/Batman comic book, and his activities are limited to Japan. Winslow Schott remains active as the Toyman in the United States. In the Sam Loeb-penned memorial issue Superman/Batman #26, Okamura fakes his own kidnapping at the hands of Schott, forcing Superboy and Robin to search through his complex to save his life. Realizing his loneliness, Superboy and Robin extend their friendship to the boy. Okamura joins Robin and the other Teen Titans at Titans Tower for Superboy's funeral, clutching a Superboy action figure. In Superman/Batman #45, he offers to assist the duo in their quest to rid the world of Kryptonite, using spider-like nanobots to collect Kryptonite molecules in the air. His offer becomes a necessity as Lana Lang, in a last-ditch effort to get rid of Kryptonians and keep LexCorp afloat, turns a set of Kryptonite caches into "dirty bombs", which irradiate the entire planet. Hiro comes to the rescue, settling for a Power Girl-bot to "date". Instead, he gets his dream date, a dinner in Paris with the real Karen, and the status of honorary member of the Justice League. A future version of Hiro, allied with a power-hungry group of Titans, travels back in time to modern day to cement their power-base in Teen Titans #52 (Jan. 2008). Hiro appears as one of Winslow Schott's androids in Action Comics #865; given the unreliable nature of Schott's narration, Hiro's status as his android creation is suspect. Toyman surfaces in Metropolis and allies with Lex Luthor in Action Comics #837 (May 2006) as part of the One Year Later 'Up, Up, and Away' story arc. His first appearance was written by Geoff Johns and Kurt Busiek with art by Pete Woods. His appearance, inspired by the character's Superman: The Animated Series incarnation, is that of a child-sized doll. This Toyman mentions meeting Hiro Okamura in Japan and stealing one of his Superman robots. As part of his bargain with Luthor, he is given the information needed to find his creator Winslow Schott in exchange for assistance in a plot against Superman. This Toyman, renamed Toyboy, is shown amongst Schott's other robots in Action Comics #865, and appears as Toyboy alongside Schott in the 2009-2010 World's Finest limited series. On the cover of Justice League of America (vol. 2) #13, it shows this android Toyman as a member of the Injustice League. The Toyman doesn't have any real powers, but he possessed incredible technological expertise and inventiveness, and specialized in robotics, though he had also shown expertise in biological weaponry. Despite the childish motif which he usually insists on incorporating, Toyman's creations were incredibly sophisticated and deadly. In addition, most of his inventions had an innocuous, or even comical appearance that causes his opponents hesitation or confusion, often to their regret. A version of Toyman appears in World's Finest Comics #167 (June, 1967). Toyman notorious criminal, enemy of Superman. He tried to start a crime spree in Gotham City, but was promptly stopped by Superman, Supergirl and Batman. In his defeat, Toyman used a prototype molecular-dissolver ray on Batman, which affected him in the same way as Gold Kryptonite affects Kryptonians. A female version of Toyman named Toywoman appears in Superman #349 (July, 1980). Toywoman is the gender-inverted version of Winslow Schott, the criminal known as Toyman, created by Mister Mxyzptlk to serve as an enemy to Superwoman. The bizarro Toyman appears in Action Comics #856 (November, 2007). When Bizarro III found himself infused with radiation from a blue sun, he developed the ability to replicate himself as well as create other "Bizarro" lifeforms based upon likenesses of people from Earth. He used this power to populate a cube-shaped planetoid dubbed Bizarro World within the blue sun star system. One of the many duplicates that he created was a Bizarro version of Superman's adversary the Toyman. Bizarro imprisoned Toyman inside of his Fourtriss uv Bizarro along with several other known foes. Throughout the Multiverse. On Earth-12, a robotic Toyman lives. For more information, see the other media section below. 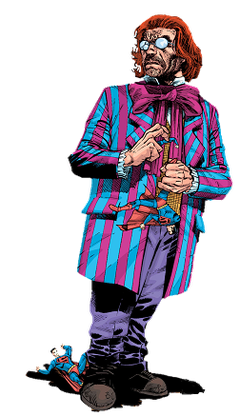 On Earth-31, an elderly version of the Toyman- never referred to as such, merely as Winslow- is contacted by the Joker to provide him with dangerous toys, such as exploding dolls. In the maxi-series Justice, Winslow Schott is contacted by Brainiac to help prevent the end of the world-really an attempt to destroy all organic life. Throughout the story, he uses dangerous toys to menace the heroes, including an attempt on Hawkman and Hawkwoman's lives. When they attack his base, they find the microscopic mind controlling robotic worms that lead them to the villains. By the end of the story, Schott has been reduced a semi-robotic being by the worms, reducing him to a puppet for Brainiac. It should be noted his primary toy throughout the story is a giant marionette based on Jack Nimball. Toyman first appears in animated form in The New Adventures of Superman. This particular Toyman is the son of the original Winslow Schott version. Toyman is a recurring villain on Challenge of the Super Friends television cartoon voiced by Frank Welker. He appears as one of the members of Lex Luthor's Legion of Doom. The Toyman in the Super Friends series bears the likeness of Jack Nimball (as he is named in the comics). Toyman was supposed to appear in the episode "The Case of the Dreadful Dolls" during Super Friends: The Legendary Super Powers Show as the villain, but was off-limits and replaced by an exclusive villain known as the Dollmaker (not to be confused with the Batman villain of the same moniker). However the Dollmaker's lair is located in Schott's Toymaking Factory. An unrelated Toyman resembles Jack Nimball appears in The Plastic Man Comedy/Adventure Show episode "Toyman" voiced by Alan Oppenheimer. This one is dressed like a jester similar to the Jack Nimball version, but the costume is now red, green, and yellow and he has a wind up key on his back which needs to be rewound at regular intervals to keep him animated. Toyman as he appears throughout the DC animated universe. Toyman first appears in the 1990s series Superman: The Animated Series voiced by Bud Cort. He is an insane man who wears an ever-smiling mask similar to a doll's head, which he is never seen without. His arsenal of weapons includes a giant superball that can smash concrete and an "inescapable" bubble-blower. In this version, Winslow Schott Jr. is the son of a kindly toymaker, who spent all day in his father's shop watching him making the toys. Winslow Schott Sr. dreamed of building a toy factory, but lack of capital prevented it. Infamous Metropolis mob boss Bruno Mannheim offered to bankroll Schott to build the toy factory. Unknown to Schott, Mannheim used it as a front for a numbers racket. When the police uncovered the scheme, the gangsters fled, leaving the elder Schott to be framed for running the operation and falsely imprisoned for ten years for embezzlement. Schott eventually died in prison before he could be paroled and Winslow was left on his own and spent several years in abusive and neglectful foster homes. By the time he reached adulthood, Winslow was mentally ill. Making use of his natural aptitude for mechanics, he decided to make up for his ruined childhood by terrorizing the world and stealing money to amass his own personal fortune. Toyman appears in two episodes: "Fun and Games" and "Obsession". His plans revolve around Darci, a lifelike android created to be his companion, but he also seeks revenge against Bruno Mannheim, the criminal who wronged his father, and against Superman for foiling his schemes. Several scenes from "Fun and Games" were used in the title sequence of all three seasons of Superman: The Animated Series. Toyman also appears in Static Shock episode "Toys in the Hood" voiced again by Bud Cort. Toyman (who is revealed to have survived the events of "Obsession" after his helicopter is destroyed) orders Darci to capture Static's friend Daisy so she can serve as a model for Darci's nanite-constructed new body. After Superman and Static confront Toyman, Darci betrays Toyman and tries to escape, only to discover that Toyman had implanted a fail-safe device programmed to have the nanites destroy her if she turns on him. Darci's body melts and Toyman is taken to jail. In the Justice League episode "Hereafter", Toyman (voiced by Corey Burton) is a member of the Superman Revenge Squad. During their attack on the city of Metropolis, he uses an experimental machine (which resembles a giant toy robot) that can fire blasts of energy from its "chest". Toyman first targets innocent bystanders before trying to blast Superman. Toyman then fires a blast at Batman and the injured Wonder Woman. To save his friends, Superman flies straight into the blast and everyone, including Toyman himself, believes that he had been vaporized. Batman was the only one who refused to accept Superman was dead, as his body simply disappeared without any remains being left behind. It was later revealed that Superman had been sent to an apocalyptic future, only to escape and prevent the catastrophe with the help of a reformed Vandal Savage. In Justice League Unlimited, Toyman (voiced again by Bud Cort) is a member of Grodd's new Secret Society. He is prominently featured in the episode "Alive! ", in which he becomes the pilot of the Secret Society's spaceship. When a riot erupts and divides the villains into two factions, he holds his own and defeats Killer Frost with a headbutt, cracking his mask on the side, and a few tricks with a heavily rigged yo-yo. In the following Justice League Unlimited episode "Destroyer", the series finale, Toyman is briefly shown firing what appear to resemble Nerf darts at Darkseid's parademons. What makes these darts deadly is that they cause the Parademons to explode shortly after impact. He is one of a handful of Secret Society villains to survive the series finale. The Jack Nimball version of Toyman briefly appears in the season five episode of The Batman entitled "Lost Heroes" Pt. 1 voiced by Richard Green. Batman muses that a psychiatrist could make a whole career out of Toyman, though Superman warns not to underestimate him. He faces off against Batman and Superman with his toys and high-tech punching gloves. He ends up knocked out by some bombs. He should not be confused with Toymaker, another character created specifically for the show and who shares his toy-based M.O. Toyman appears in the Batman: The Brave and the Bold episode "Battle of the Superheroes!" voiced by John DiMaggio. He causes a robbery until he ends up running afoul of Superman and Batman. Due to the Red Kryptonite gifts that had been unknowingly given to Lois Lane and Jimmy Olsen by Lex Luthor, Superman ends up going rogue and nearly kills Toyman only for Batman to save Toyman and hand him over to the police. A villain in Batman: The Brave and the Bold named Funhaus is based on Jack Nimball version of Toyman, while being more imposing. He appears in Mayhem of the Music Meister and voiced by Gary Anthony Williams. A young Silver Age Toyman appears in the Young Justice episode "Intervention" voiced by Cameron Bowen. He goes on a rampage in a giant Toy-Soldier to rob the First Bank of Metropolis only for him to be defeated by the Blue Beetle. A villainous and diminutive version of Hiro Okamura appears in the Justice League Action episode "Play Date", voiced by Ken Jeong. He and his toys invade the Justice League Watchtower where he makes video game players out of Superman, Wonder Woman, and Batman. Toyman competes against Cyborg in a real-life version of "Boulevard Brawl 2" which Cyborg, Robin, and Blue Beetle tend to play. While Cyborg controls Batman, Toyman controls Superman in Round 1 and Wonder Woman in Round 2. Before Toyman can make Cyborg his unlocked character, it was revealed that Cyborg hacked into some of Toyman's toys enabling him to free Superman, Wonder Woman, and Batman from Toyman's control. Toyman goes on the run where he is caught by Superman, Wonder Woman, Batman, and Cyborg with some help from some reprogrammed toys. A different version of Toyman named Orlich Hoffman appears in Wonder Woman episode "The Deadly Toys" portrayed by Frank Gorshin. A character named Winslow P. Schott appears in the Christmas episode "Seasons Greedings" portrayed by Sherman Hemsley. With a similar background to the post-Crisis Schott in the comics, he creates a toy that causes kids to become greedy and adults to act like children. Unlike past versions, he shows a genuine love for kids and turns over a new leaf toward the end of the episode after trying to save a child from a horse while also being saved by Superman. He is referred to only once as being "a toyman" in passing onscreen. A later episode features a childlike character named Toyman (played by Grant Shaud) who abducts children. His real identity is Harold Kripstly and sends special toys to children that teleport him to his secret hideout beneath a fast food restaurant. Thanks to a tip from Lois Lane after she was accidentally abducted by one of Harold's toys, Superman was able to save Lois and apprehends Harold. Chris Gauthier as Toyman in Smallville. Toyman appeared three times in Smallville. In the fourteenth episode of the show's eighth season, titled "Requiem", portrayed by Chris Gauthier, Winslow Schott is a toymaker and former Queen Industries employee with a grudge against Oliver Queen. He is a scientific inventor at STAR Labs who was hired by Oliver Queen to work for Queen Industries. A great mind, though a bit eccentric, he expressed his individuality by bringing toys to work. However, he went too far when he began putting explosives in toys, which caused his immediate termination from the company. He is revealed to be working for Lex Luthor, currently disfigured and partially crippled, and hiding in a mobile base. He speaks to Luthor through a camera and microphone concealed in a wooden doll's head, and uses toys such as an exploding Newton's cradle, knockout gas-filled Mylar balloons, and an explosive cymbal-clanging monkey. After he fails twice to kill Oliver, he escapes police custody. Oliver Queen blows up Lex's mobile base with one of Toyman's toys in order to frame Schott, which puts him on the run. In that episode, Clark Kent referred to him as "Toyman" but most of the time he was referred as Toymaker; and is also referred to as "Toyboy". In the season 9 episode "Echo" he is referred as Toyman by himself, Chloe Sullivan, Clark and the Daily Planet. He attempts to test Clark by leaving a bomb next to a group of bound and gagged men and women he had kidnapped, eventually leading to Clark using his superspeed to rescue them. In that same episode, he returns and attempts to kill Oliver Queen as revenge for being framed for Lex's demise. This episode also has an android version of Schott. After he is caught, and facing time in solitary confinement, Tess Mercer visits Schott in jail and gives him the Kryptonite-powered heart to study which Zod and his men created to power John Corben in previous episodes. Toyman makes his final appearance in Smallville's penultimate episode "Prophecy" where he was still in jail confined to solitary, nevertheless he managed to gather a team called Marionette Ventures, an organization that works to control the water front properties composed by Metallo, Roulette, Dark Archer, Black Manta, Captain Cold and Solomon Grundy. Toyman was approached by Courtney Whitmore who was placed with a mind control device and used her to do his organization's bidding. When that failed, he was confronted by Lois Lane (who has Clark's powers for the day, a gift from Jor-El for their pending nuptials), who he convinced that if she did not put on the device that he would send his evil companions to destroy Clark Kent. He then sent her to kill him. However, she failed and Clark confronts Toyman face to face. Even though Toyman knew Clark's true identity, Clark knew he would not reveal it to the public because the Toyman still had some "games" to play. Finally he assures him no matter what he's planning for the future, he will always be there to stop him. Okamura Toys appears in The Flash episode "Running to Stand Still". Toyman appears in Supergirl, portrayed by Henry Czerny. He appears in episode "Childish Things". More than a decade ago, Winslow Schott tried to blow up his boss Chester Dunholz with a bomb disguised as a gift for supposedly stealing his projects. The bomb spared Dunholz, but killed six employees. At the time of the bombing, his son Winslow "Winn" Schott Jr. (portrayed by Jeremy Jordan) was 11 years old and had never forgiven him for giving in to his rage. After Schott escapes from prison, he attempts to kill Dunholz again, even going as far as to cajole Winn into joining the plot lest he blow up an entire convention center, before ultimately being apprehended by Supergirl. In the episode "Schott Through the Heart" Winslow Schott has died and his funeral is disrupted by a bomb in his casket. The episode "Schott Through the Heart" introduces a new Toywoman in Jacqueline Nimball (portrayed by Brooke Smith), who is a female version of Jack Nimball. Following Winslow Schott's death, his protégé Nimball sends flying monkeys into the D.E.O. to target the original Toyman's ex-wife Mary and son Winn. Winn and Mary work together with Supergirl to defeat Jacqueline. Toyman appears in Gotham, portrayed by Thomas Lyon. He appears in episode "Pieces of a Broken Mirror". Griffin Krank is the former owner of Krank Toys and Models and the father of Cosmo Krank. He is an assassin, alias "The Toy Maker", that uses modified, weaponized antique toys to murder his victims. He was hired by The Riddler to kill Leslie Thompkins, a task he ultimately failed to complete. In the unproduced screenplay for Batman vs. Superman, Toyman makes a brief appearance as a reformed criminal that Batman interrogates and tortures in order to locate Joker. When they are attacked by one of the Joker's deadly gadgets, Batman narrowly escapes, leaving Toyman to be caught in an explosion. His fate isn't revealed in the script. Toyman appears in Superman: Doomsday voiced by John DiMaggio. Like most of the characters in this film, his appearance differs from that of the DCAU Toyman and he is portrayed in a more deranged and unkempt form with a goth-like form. In the movie, Toyman appears after Superman dies during a fight with Doomsday. Toyman (referred to in this movie as Winslow P. Schott) first uses a giant spider-like robot to hold a school bus full of children hostage after he robs a bank. After a secret clone of Superman defeats him, he attempts to go on the lam. Although police do recapture him, he kills a four-year-old girl off screen during the capture. Upon hearing the news, the Superman clone angrily takes Toyman from the police outside the police department and flies straight up into the sky. Toyman says that he has rights and had nothing to say to which the Superman clone responded with, "How about good-bye?" and suddenly drops him to his death from high above the city. Toyman lands on a police car onscreen, and his death marks the beginning of the Superman clone's harsher stance on crime than the real Superman. The Hiro Okamura version of Toyman appears in Superman/Batman: Public Enemies voiced by Calvin Tran. He helps Superman and Batman into finding a way to stop the Kryptonite Meteor. His result being a ship that resembles Composite Superman. He is shown to be highly intelligent in the fields of science and technology and is stated to have an I.Q. of 210. He is also alluded to be hyper-sexually and inappropriately behaving towards Power Girl, who avoids his presence; at one point, when Batman and Superman arrive at his base, Power Girl says that she'll wait outside and when they go inside, Toyman tells them to tell Power Girl that he's sorry about the x-ray goggles as he takes the broken goggles off. In another instance, when asked if his rocket can stop the meteor, he retorts, "Does Power Girl have big---?" before Batman abruptly cuts him off. The Jack Nimball version of Toyman appears in the direct-to-video animated film JLA Adventures: Trapped in Time voiced by Tom Gibis. He appears as a member of the Legion of Doom. In this version, he is actually a living wooden doll. In the future, his history is forgotten as his body is labeled "Unknown Totem". Toyman appears in the DC Universe Online video game, voiced by Matt Hislope. In Batman: Arkham Origins Blackgate, upon completing the Detective Case called "Ground Zero", it is revealed that the Toyman was an inmate within Blackgate Penitentiary until he was blackmailed by someone outside the prison (implied to be Amanda Waller), who smuggled in an explosive bracelet and attached it to his arm. It is stated that Toyman was killed when he tried to remove the bracelet, but this is likely a continuity error considering this game takes place before the events of Batman: Arkham City unless there are different Toymen existing in this universe. Toyman appears as a playable character in Lego Batman 3: Beyond Gotham, voiced by Nolan North. Toyman appears as a playable character in Lego DC Super-Villains. Toyman appears in issue 2 of the Batman: The Brave and the Bold comics. The Hiro Omakura version also appears. Winslow Schott and Hiro Okamura is featured in the Smallville Season 11 digital comic based on the TV series, Toyman appears in a 2013 Smallville Season Eleven comic. At LexCorp R&D, Superman and Lex are all forced friendly-like as Lex analyzes the teleportation vest used by a some criminals in a hostage situation and admits the technology is his, but that it was stolen during a series of robberies made on Lexcorp and other companies, one of which was foiled way back by the Green Arrow and Superman. Lex surmises that whoever created these teleportation vests using all that stolen technology would have to be very familiar with Lexcorp's patents and proprietary coding. This leads Superman to Stryker's Island prison and Winslow who is still incarcerated and seemingly not a suspect, according to Warden Draper, since he has been under constant supervision in "hyper-solitary". Lois Lane arrives at Stryker's Island to question Toyman about Prankster. Toyman reveals that Prankster is just a pathetic imitation of him; they worked together in the Queen Industries Research and Development Department before Toyman started working for Lex. Winslow then asks Lois if Lex asked about him since his return, which leads Lois to retort that Toyman must rank pretty low since his memory has been removed. Toyman reveals that Oswald has no sense of gamesmanship and would cheat whenever he can and had stolen his idea for kryptonite bullets. It is later revealed Schott modified Corben's kryptonite heart, giving Corben the power to absorb the kryptonite radiation once Schott has reinstall it. The Hiro Okamura version of Toyman appears in the Catwoman: Queen of Thieves podcast. They do not refer to him as Toyman but, according to the show, he had helped Catwoman steal things by inventing devices. Toyman is featured in several segments of Robot Chicken DC Universe Special voiced by Seth Green. He is mostly seen with the Legion of Doom. ^ Whatever Happened to the Man of Tomorrow? ^ Commentary for "The Case of the Dreadful Dolls" on the DVD Super Friends: The Legendary Super Powers Show. ^ Burlingame, Russ (October 26, 2015). "Henry Czerny Cast as Toyman on Supergirl". Comicbook.com. ^ Ge, Linda (March 2, 2015). "CBS's 'Supergirl' Casts 'Last Five Years' Star Jeremy Jordan". The Wrap. ^ Wells, Buckie (April 17, 2018). "Supergirl recap: Winn's mother arrives in Schott Through the Heart". Fansided.